Over the years, Technology & Learning and its predecessors have written about the big edtech issues as they’ve arisen and the concerns that educators have had about them. So this month we’ll look at what we’ve thinking about for the past 35 years. And we’ll see how these concerns compare to our big ideas and worries today. We were eager to talk about the possibilities yet we were worried about our ability to use computers for appropriate learning tasks and to take advantage of the unique capabilities of computers to help students learn. In the early days between 1981 and 1982 we published articles on how classroom computers could make a difference. We noted that research raised more questions than answers about the machines, techniques, and software. A cover story in 1985, “Girls Don’t Like Fluff Ware Either,” tackled the perennial issue of gender with a look at the software industry’s attempts to interest girls in computers. Things moved quickly. By 1986, interactive video was the next big thing and educators were hooked. The emerging technology was telecommunications, and two years later we published a three-part primer on networking that introduced educators to the technical and educational implications of introducing LANs in their schools. 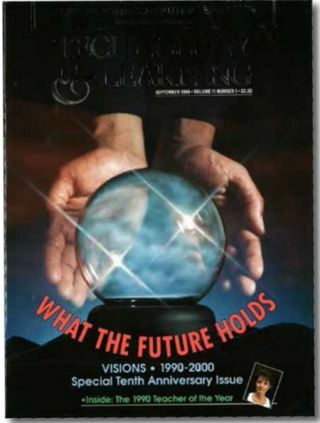 In 1990, with the perspective of ten years, we chronicled software trends. Broderbund spawned new genres: design programs like The Print Shop and collaborative problem-solving software like Oregon Trail. Another trend was the use of productivity tools in the classroom—word processors, databases, and spreadsheets. ■ Interest in purchasing MS-DOS computers for student use. ■ Increases in memory, graphics, and other capabilities that led to new software features. For example, built-in speech capabilities spurred the development of software programs that talked. ■ Networking. When IBM set up its networked PS/2 labs in schools, it led to another trend—the rebirth of integrated learning systems with ILS curricula redesigned to address state-developed frameworks. Then the Macintosh with HyperCard became the first machine to demonstrate the promise of multimedia technologies and hyperlinking. Nothing was ever the same after that. The explosion of the World Wide Web in the 1990s relied on hyperlinks. The next year saw the release of two important documents from Washington. The Department of Education published the first National Educational Technology Plan, and Congress passed the Telecommunications Act of 1996, which included the E-Rate. Widespread telecommunications brought new challenges and opportunities. We saw the need to teach students to be savvy media critics; we designed effective AUPs; and we started to tap into virtual school experiences. At the end of the century, T&L noted the following big issues and concerns: Internet safety, preparing new teachers, enterprise computing, accountability, high-stakes testing, online publishing, and mobile computing. As Technology & Learning looked ahead, the biggest issues in the year 2000 were both perennial and signs of the times. In an age in which the Web looked a lot like the Wild West, educating students to be media literate was essential. Professional development was a major concern as well, and the hope was that “Anytime, Anywhere PD” would herald a new era of flexibility. Over the following few years, the issues start to look familiar. One-to-one was growing, and T&L reported that pioneering schools that gave students their own laptops saw improvements in attendance, dropout rates, and learner engagement. In the early 2000s, we began to think small. Power, portability, and price merged such that the time was right for handheld devices in schools. In 2003, Congress passed the No Child Left Behind Act and we entered an era of requirements to measure student achievement, more stringent teacher certification standards, and testing—all of which technology made more feasible. Other concerns included wired versus wireless, portable MP3 players for podcasting, and handheld computing. Computers got smaller and bandwidth got bigger. Tools and apps replaced installed software and products on a server or computer. By T&L’s thirtieth anniversary in 2005, some of the primary issues in edtech were cybersecurity, privacy, smartphones in classrooms, funding, personal learning networks, and online learning. Big decisions included how to handle an influx of personal mobile computing devices, and those conversations centered on network infrastructure, policy, instructional strategies, and preparing teachers for this change. Between then and now, we’ve seen many of the same issues remain center stage and we’ve added STEM, BYOD, digital video, tablets, and going mobile. As always, funding, accountability, online testing, and professional development are on our minds. We still talk about the most effective uses of technology for teaching and learning. We’ve come full circle on at least one concern from 20 years ago. Our 1995 list of worries included “Will kids become antisocial if they spend lots of time at the computer?” Today we see how social media has transformed everything, including students’ often too-social behavior. What will we be thinking about in the next few years? According to the latest NMC Horizon Report, we can expect to see BYOD programs, cloud computing, mobile learning, and makerspaces take root. In the next two to three years, 3-D printing, visualization, learning analytics, and adaptive learning technologies will become common. In four to five years, researchers expect to see badges for validating achievements and microcredit transactions, drones, visual data analysis, and wearable electronics. Whatever the odds are that these trends will become the next new things, T&L will be here reporting on them—and on the other tools, techniques, and topics of interest. 1 Gender equity: Why do fewer girls flock to the computer? 2 All kinds of equity: Is technology widening the gap between the “haves” and the “have nots”? 3 Will kids become antisocial if they spend lots of time at the computer? 4 Will computers replace teachers? 5 Are computers too abstract for little kids? 6 Should computers be placed in labs or in the classroom? 7 Does technology improve learning? Can we prove it? 8 Will/should computers replace textbooks? 9 Will/should computers and related technologies do away with the need for basic skills such as handwriting and long division? 10 Should computer-based curricula be set from the top down in the form of comprehensive, integrated programs such as ILS, or should individual teachers pick and choose for themselves? 11 Will teachers ever embrace technology fully? 12 How do we invest in new hardware without becoming obsolete by next year? 13 Is the software out there any good? 14 Do we need national standards and, if so, what should they consist of? 15 When budgets are tight, is technology the right way to spend money?